Artist Mira Michelle used a period of unemployment and personal hardship to change her lifestyle. 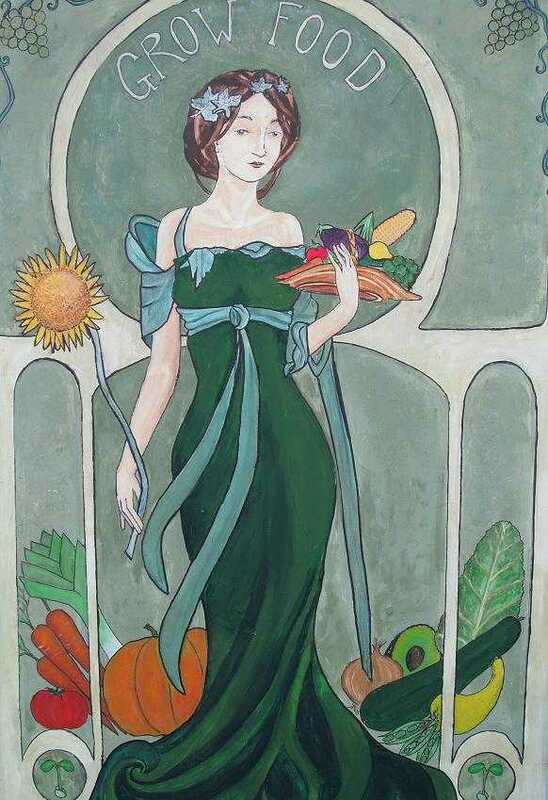 In the process, she was inspired to create new artwork--her "Abundant Solutions" series, influenced by French Deco illustrations. Read her essay about how the experience enabled her to feel more strongly connected to her core values and her community, and prompted her to reconsider the relationship between the economy, ecology and home. I lost my job a year ago and I remember feeling at the time that the ground was unstable under my feet. I had been the Coordinator for an arts program for young women that focused on leadership and youth empowerment. The organization was impacted by the budget cuts to education and a shrinking donor base. I had worked as an artist, activist and a youth educator for almost a decade and I found myself pushing 30 without any savings and facing the unknown. What seemed so devastating at the time remarkably brought unique blessings into my life. I lacked steady income so I planted vegetables in the backyard to eat. I stopped using my car as much so that I did not have to pay for gas and I rode my bike. Instead of being a hardship, the things that I started to do to conserve money ended up contributing to my life. When I biked I could feel the wind on my skin and the muscles stretch in my legs, and I could greet my neighbors by name. It benefited both the environment and my quality of my life. I started to paint about what I was experiencing. "Abundant Solutions" was the first piece in my new series. 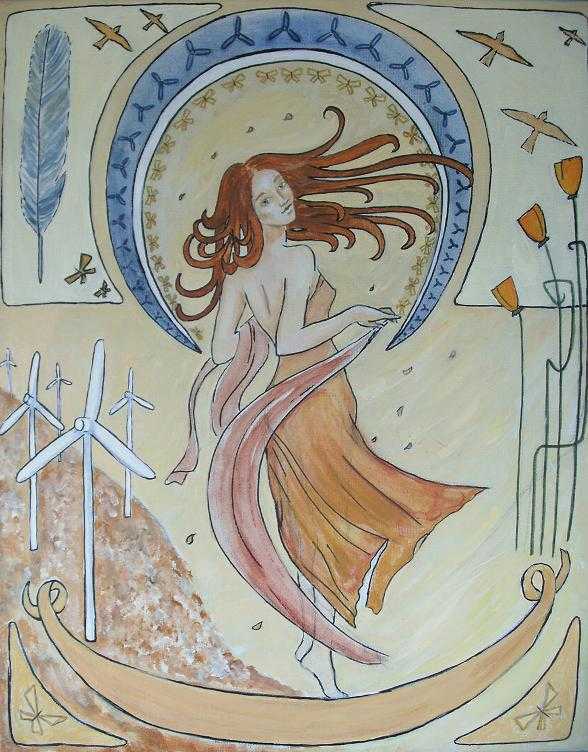 The panels in the painting represented my vision of a new economy, an economy based upon people instead of profit, where we grew our own food and invested in alternative energy options like solar panels, wind turbines and tide power. The Celtic knots of intertwining vines at the bottom of the painting represented the interconnected ecosystem around us. The small blue house represented my home. The crown of flowers in the woman's hair depicted the diversity that exists in nature. 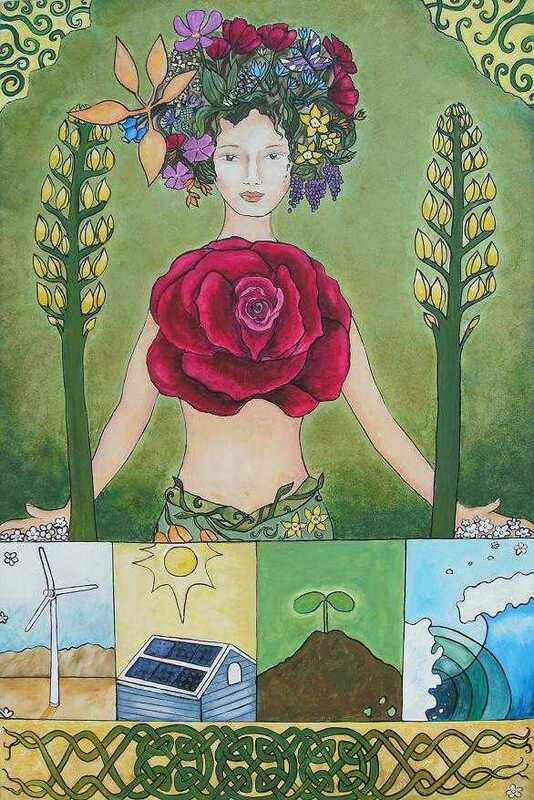 The woman with the flowering heart depicted both the abundance of nature and the joy I was experiencing making new choices that honored the earth. 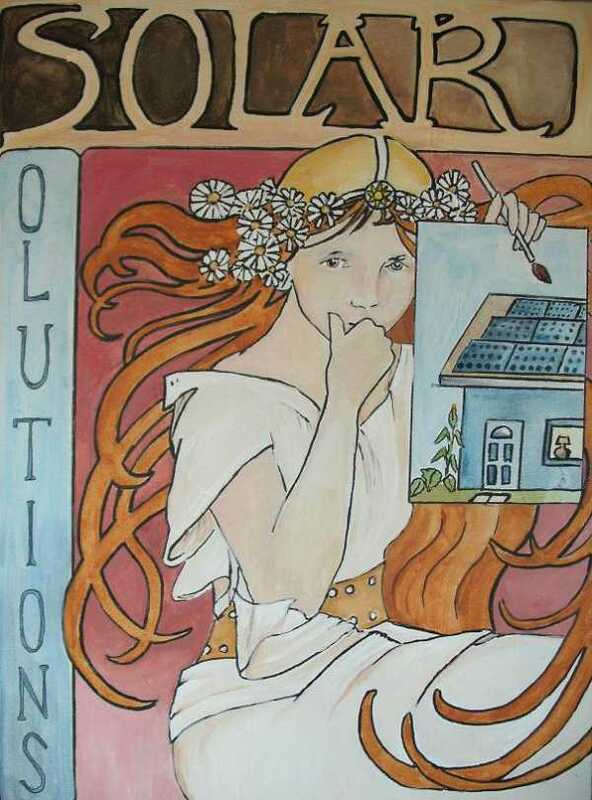 I started to learn more about some solutions to the issues we are facing as a nation and as a planet. I learned that money spent at locally owned businesses would continue to circulate within that community. I learned that if we made conscious choices about where we spent our money and what we spent it on, we could create change. I also learned that we in the United States we consume far more that we need. I learned about living simpler, buying less and cultivating a sense of sufficiency with what I had. When my new series of paintings was completed, I opened up my home to share my work with my friends, neighbors and community. We posted signs on street corner and hung the walls of my house with my art. The rooms become filled with people who walked in off the street. My living room became a place of dialogue and sharing. I had the beautiful opportunity to experience directly this "new" economy as my community generously supported my art. In my artistic exploration of these themes, I have learned that economy and ecology have the same root word. Both words come from the Greek work "eco" which means home or household. Ecology is the system of how our planet works as a home. Economy is the regulation of how a household works. It is time to put our economy back in to balanced a relationship with our ecology. It is time to build an economy that supports and benefits our ecosystem instead of destroying it while simultaneously supporting our local communities with "green" jobs. My paintings explore this new relationship between economy, ecology and home.